...The Kingdoms of this world are become the Kingdoms of our Lord.... Amen. (Rev.11:15 KJV): OPERATING IN THE POWER OF MY ORDAINED PEACE!!! LORD, thou will ordain peace for us: for thou also hast wrought all our works in us. Jesus we thank you for your wondrous work in our lives, lord as we are hearing your word give us the grace to act on them that we may indeed operate in the power of our ordained peace, Amen! There are a lot of graduates out there yet no jobs even with their qualifications because there is an error somewhere they have been subjected to what they wouldn’t at all love to do but so that they will not die of hunger, they have to do anything they lay their hands on to survive, those working and due for promotion nothing has been done about that! Student will reads to write exams and pass but at the end you see that brilliant student packing carry-over courses in a Ghana- must- go bag, no more peace in your place of work, your home no peace, you can’t even feel free even among your friends, broken relationships, disappointment, no capital to start business and the people that even promise to help you financially are now blowing grammar that will cause you to have headache and you will end up looking for money to buy drugs. That’s what happens when you ignore the wisdom of God and feels you can do all things by your power. You have to choose you will serve because you can’t serve two masters at the same time. Stop allowing people to use you to achieve their mischievous plan! A beautiful young lady once had a golden opportunity to flow in abundance of wealth, power to achieve all her dreams through her talent, she can dance and so one day she was given an invitation to come to the king birthday party and dance and she went and so danced so majestically, all the invitees were so pleased till the king stood up and promise the talented dancer with an oath to give to her whatever she will ask for but because of who this beautiful dance get advice from, she misused that golden opportunity and when she opened her mouth to speaks she said “give me here John Baptist’s head in a charger. The King was sorry: nevertheless for the oath’s sake, and them which sat with him at meat, he commanded it to be given her. What! What will a beautiful young lady with such a talent, full of ambitions wants to achieve with human’s head? What a waste of talent and time. That is how so many of us are. Who is advising you? Who is your mentor? Are you being misled? What did you really achieve from all the advises you received from them last year? Today the God of second chance is here! Let us search and try our ways and turn again to the Lord. God is the potter and you are the clay. when you are operating in the world kind of peace, you will ever be uncomfortable and unsatisfied with God's peace you will experience unspeakable peace! 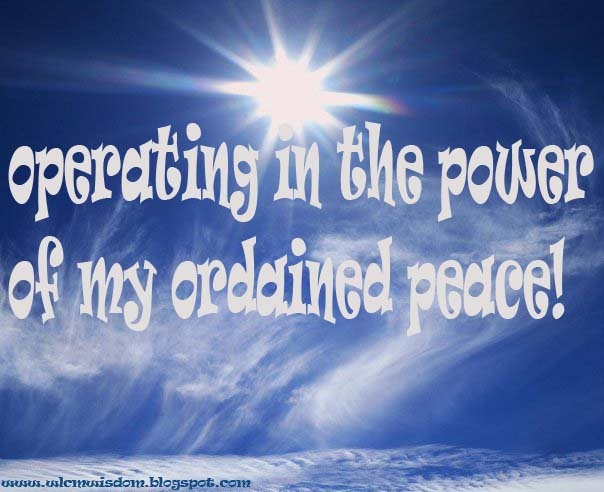 beloved please now is the acceptable time…make a choice, make a change and experience how it feels to operate in the power of your ordained peace! And Ye shall know the truth and the truth shall make you free John 8:32. God is able to do in your life that which no man can do, just hold to him and be patient for he will never leave you nor forsake you. Chincobee and bolatito the Peace will locate you where ever you are distant is not a barrier, God will extend His peace unto you like a river and the glory of the Gentiles like a flowing stream(Isaiah 66:12) in Jesus' name, Amen! stay blessed my Secretary and women's president! Dear Lord, help me to walk through this journey of life with your wisdom and peace. Amen. P.S. Thanks for sharing, ma'm Lucy. Receive Grace to live a life that is worthy in God's sight in Jesus' name, Amen! Dear Lord i refuse to walk with my wisdom, I refuse to do things my own way. May you always direct and order my steps. "Student will reads to write exams and pass but at the end you see that brilliant student packing carry-over courses in a Ghana- must- go bag" lol @the Ghana must go part. Things you may want to do that will take you off the track of God in your life, I order your step according to God's plan and purpose in your life in Jesus' name, Amen! We pray for a life filled with God's wisdom in Jesus name.